Since time began, people have loved a good story. Perhaps it was this innate need to learn about others’ lives that attracted me in the first instance to become involved in the establishment of the Australian Stockman’s Hall of Fame …..a place which, as the name suggests, promised from the outset to capture stories. Interesting stories. And through them, to capture a picture of a particular Australian lifestyle. My memoir, In Stockmen’s Footsteps, which was released by Allen & Unwin in March, is a story that many people will relate to. It tells how I grew up on a farm on the Darling Downs in the Fifties and Sixties; moved through the travel and hippie ‘must-do’ experiences of the times; and eventually settled down with my teeth in a tiger’s tail. It was my intention in dealing with my personal story in In Stockmen’s Footsteps to capture the general story of Australian colonialism – in my case, one going back to the First Fleet. Like many Australians, I count myself as a multi-generational country person; I grew up within the cadence of Australian rural life during the post-war period. Our lives were regulated by leftover army disciplines, dominated by Anglo Saxon mores, unruffled by the sorts of social upheaval that had wreaked such havoc on our parents’ and grandparents’ lives – World War One, the Great Depression, then World War 2. On our Darling Downs farm we lived (despite the lack of much of the technology that was yet to come) very comfortably. Hope was the unspoken factor that underpinned our expectations. Hope was at the heart of our parents’ day to day lives as they worked on re-establishing a ‘normal’ world from the ruins of the one that so recently had been torn apart. I was blessed as a child with ignorance of these facts. 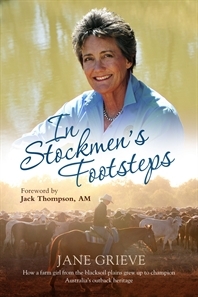 In Stockmen’s Footsteps includes my boarding school years – much more common then than now – and my world travels. It tells of my love of the Australian bush and its people, and the years I spent working as both stockman and station cook around Charters Towers in North Queensland. This is the core of the tale, as the name In Stockmen’s Footsteps suggests. Because once I settled down in Toowoomba after travelling extensively I chanced to meet RM Williams, and through him to find myself playing a pivotal role, for 10 years, in the establishment of the Australian Stockman’s Hall of Fame at Longreach. This I did from Toowoomba, where the head office of the company was located until I retired to marry and have a family after the Hall of Fame was opened by The Queen in 1988. This inside story, including anecdotes about my personal dealings with the prominent Australians who formed the Board of the Hall of Fame, has never before been told. Above all it is a story of love; the love of a group of successful people for the country that nurtured them. And their love and respect for each other in the process of building a major National Monument.